Stockholm has seen quite a bit of water this month. Where I live, we have already during the first 10 days had more rain than most whole months will give (125mm right now, and counting). This pic was taken during the annual Stockholm cruising night. 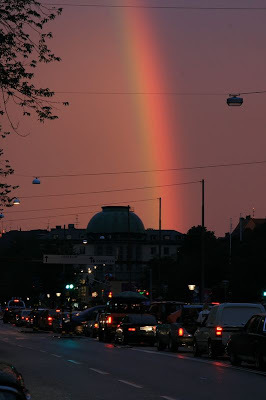 It was raining on that night too, but suddenly the sun decided to show up for a short while at 21 p.m, giving us a marvellous rainbow over the city. This view is from Sveavägen, facing the observatory. Witness: the Observatory Grove is a groovy grove!